The Lake Havasu Area Chamber Ambassadors held a ribbon cutting ceremony for Tranquility Salon and Day Spa celebrating its grand opening. Attending the ribbon cutting from left to right were Gene Apedaile, Mike Schuler, Barbara Stevenson, Tia Brooks, Shelley Culbertson, Lisa Wooldridge, Matt Mattos, Ashley Brewer, Shasta Burress, Jenni Fruin, Meagen Johnston, Lisa Cano, and Sergi Heideman. 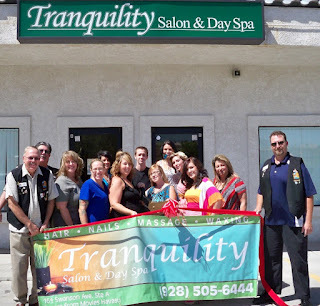 Tranquility Salon and Day Spa’s staff includes a variety of specialist in the cosmetology industry such as, hairstylist, massage therapist and estheticians. For more information contact them at 928-505-6444.